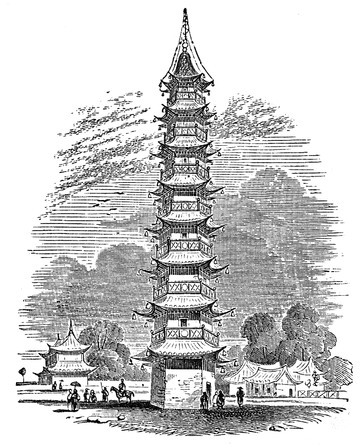 This is a drawing of what was referred to as the Porcelain Tower which was located in Nanjing China. Before it was destroyed, the tower shone in both sunlight and daylight as it was made of white porcelain which was decorated with a variety of glazes and adorned with numerous Buddhist images. It was once one of the largest buildings in China. This historical building illustration is in the public domain and would make a great bit of Asian flavor in your next creative work. Our Parlour Panarama proved to be a great find. George Cupples and his publisher T. Nelson and Sons used a number of great illustrations in this 1882 release.